BUFFALO, NY (WBFO) – The AARP, in partnership with several agencies representing various ethnic and racial interests, has collected and relayed local feedback on concerns within their respective communities, specifically involving people ages 50 and older. The localized follow-up to the AARP’s statewide study is being passed on to local elected officials with the hopes it will spark policy change. 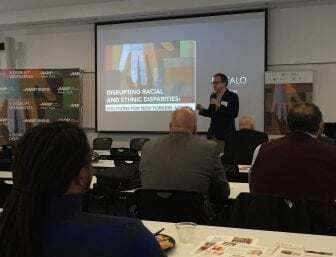 Randy Hoak, AARP Associate State Director for Western New York, delivers remarks at a recent gathering at the University of Buffalo, where locally gathered feedback on “Disrupting Disparities” was detailed. The AARP, Hispanic Federation, NAACP and New York Urban League are among the partners which conducted the statewide report titled Disrupting Racial and Ethnic Disparities, which was released earlier this year. Last month, several listening sessions were held at community centers throughout the City of Buffalo, where members of the public from populations of color had a chance to relay their more local concerns. Those concerns all pose threats to economic security. “You have this type of initiative going directly to the people, to the community, where the issues are, whether it be health care, whether it be the environment, whether it be the living conditions of our folks over 50, whether it be their neighborhoods, their security, their safety,” said Casimiro S. Rodriguez, Sr., of the Hispanic Heritage Council of Western New York. The report states that New York features some of the most racially and ethnically diverse counties in the country, and its population is also aging. According to the report, the number of people ages 50 and older in New York State jumped 30 percent between the years 2000 and 2015, while the number of younger people decreased in that same time period by about six percent. Pastor George Nicholas of Lincoln Memorial United Methodist Church in Buffalo says the people focused upon by this study are the grandparents who played a role in building the quality of life here. But now, they need a little help. Sometimes, these people are still taking on the challenge of caring for even older relatives. Among the changes and advancements pitched during a gathering at the University at Buffalo’s South Campus was a concept of Universal Design, an architectural concept of designing spaces that accommodate a wide range of needs, including those living with physical challenges. Language remains a challenge as well for older members of populations of color, Rodriguez noted. Local feedback is being forwarded to elected officials but Pastor Nicholas pointed out that the initiative is not at its endpoint. Additional listening sessions are planned for the future, he said.